Over the past few years, more and more institutes have been making use of the iPad as their “tool of choice” in their academic lives. It is a big financial commitment for schools that decide to build an iPad program. Resources need to be allocated and extensive changes in teaching practices need to be implemented to make sure that the iPad program becomes successful. 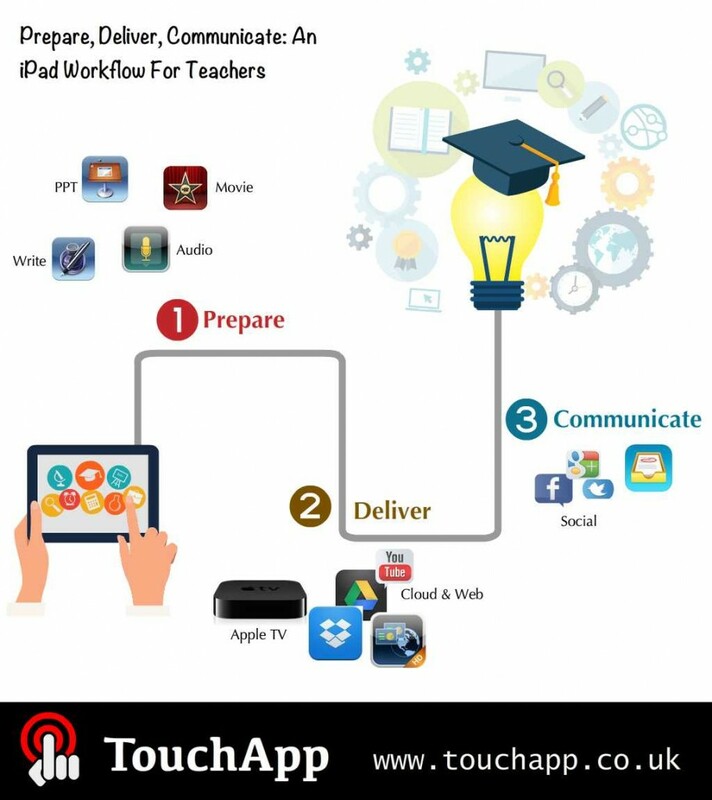 For teachers, it is essential to develop an iPad workflow that meets the instructional needs to successfully deploy iPads in schools. Workflow is as much about inspiration and elegance as it is function and efficiency. iPad workflow should address the daily interactions between students and teachers and promote new instructional practices that is specific for mobile learning. Having a workflow in place will make it straightforward for teachers to use iPads more routinely with their students. It will also increase overall iPad use in the school and supports students in accomplishing academic tasks and participating school activities. That’s where Prepare, Deliver, Communicate comes in–three words that clarify a basic sequence that can realize the potential of mobile technology in education. Transformation from paper to digital is crucial for teachers embracing iPad teaching. Teachers should be able to create their own teaching materials or acquire high quality off-the-shelf content through their iPads. There are plenty of tools available for teachers to prepare multimedia content for instructional purpose. For example, iPad app ‘Rec Pad’ allow you to record audio or video from reading transcripts which can be used to create different types of recorded content, including short lessons, demonstrations or class answer keys. A coordinated iPad curriculum should enable teachers to efficiently distribute educational resources to students. To support teaching and learning in a classroom environment, you can display your iPad on a big screen through either connectors or Apple TV. Web or cloud delivery can be achieved by numerous mobile apps such as Google Drive, Dropbox, iCloud etc. Some iPad tools such as E-Lecture Producer help teachers to transfer static presentation (.ppt or .pdf) into HTML format presentation to publish online. YouTube is also a credible platform for teachers to deliver video content through web. Interactions with students should be two-way communications and students need a way of feedback within the digital curriculum. Social networks such as Facebook, Twitter, Pinterest and Google+ etc. can be used as tools to discuss and collaborate online. There are also iPad compatible platforms to help teachers and students communicate for educational purpose. For example, you can use Showbie to share different file formats with students and it also allows them to work on and submit assignments back.